My big birthday is on Sunday, I can’t believe I will be 60! We will be having a Costa Rican themed birthday party (I think you all probably know by now that I love Costa Rica “voted happiest country on Earth”). I started off inviting a few family and friends over for a cream tea in the afternoon but over the last couple of weeks I seem to have mentioned it to more and more people, oops, I think there may be 100 or so people turn up. That’s a lot of cream scones but worse than that, how are we going to fit everyone in the house? Plus, we live in a cul-de-sac, it is Sunday afternoon, where is everyone going to park. Oh well, it’s my birthday, I shouldn’t have to worry about it! Last weekend was lovely, we went down to the Ashford International hotel on Saturday and enjoyed a meal out with the Invicta spider group in the evening (the guys who work so hard to make the annual show, the huge success that it always is). The SEAS show on Sunday was packed, the first visitor to begin the queue, turned up at 7am, now that is dedication for you! I did as always, spend a fortune but it is the show where I restock for the new year. I was careful and stuck to my extensive shopping list, I actually managed to purchase all the spiders that featured on my list, something I have never done before. I think I spent more than I have ever spent at a show but I did go for quality over quantity. When people offered me 10 ‘xyz’ for only £10, I thought about the time and effort that I would have to put into those creatures before I could sell them and politely said “no thanks”. I have finally realised after all these years, perhaps spurred on by my age? But more likely my successful businessman son, that time is money. I have never put a value on my time but I have to now. I never seem to have any spare time and as I pointed out last week I MUST get a better work/life balance. I’m so pleased with my new animals, I have some super, most sought after spiders, some beautiful new scorpions and not too much of anything else. Having Wednesday’s as ‘Ginny’s Jungle Day’ is really paying off. It could be my most successful New Year’s Resolution of all time! I now have seven events booked in the next few weeks. This Wednesday I sent off some letters to schools, met up with a magazine editor, finalised some advertising and last but not least I called our local radio station to see if they would like to meet me! I felt rather nervous but someone (I can’t for the life of me remember who) said that it would be a good idea and it certainly was. I am going on a radio show before the half term week, this will be to advertise the local library event that I am running as part of their ‘Geek Week’ during half term and I am also going on an environmental show the following week. I’m not sure what we will be speaking about but I can’t imagine that I won’t mention Costa Rica given half a chance. I am really missing my emojis, I can’t tell you how frustrating it is to write this blog without them. Everything I write these days is full of emojis, I love them – texts, emails, WhatsApp, Facebook etc. (if only my website were compatible). Got a bit side tracked there! I was going to say that I did buy some ‘proper insects’ from the show, insects that I love and that I can grow on and exhibit at my Ginny’s Jungle events. I bought some beautiful Orchid mantids, Katydids, Horse-Head grasshoppers and Leaf insects. If I have any surplus I may sell them on my website and of course if I am successful with breeding them I will sell the babies on my site. There is no doubt now that I am concentrating more on arachnids and less on the other bugs. I have been very successful with my millipedes but I have way too many, so I have reduced the price on most of them and hope to clear some space on my shelves. I’m certainly not cutting back on arachnids, I have plastic boxes and tanks of spiders and scorpions everywhere. I think I should be allowed to use the spare bedroom but my family think NOT! 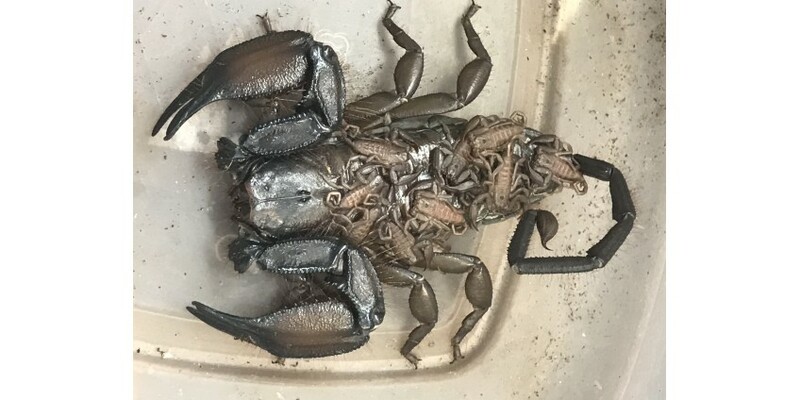 I have just housed up my baby Flat Rock scorpions, their mum is the largest specimen I have ever seen, I cannot believe the number of babies she produced. I felt mean taking her babies away but I was only talking to a breeder at the show on Sunday and he was saying that most of his babies were eaten by the mum when he left them together too long. I always try my best to breed all the animals that I keep, I recently housed my stunning Cambodian Blue tarantulas together for a couple of days. The male lived to tell the tale but I’m not positive that the female is fully adult, time will tell. Last night I introduced the adult male Indian Ornamental (P.regalis) that I got from the show, to my female. I was so pleased to see the male still intact this morning, they are stunning spiders, even the underside of them is beautiful! So much to say but I need to get a move on, I’m out for the day tomorrow and I will certainly be busy on Sunday, I’m also busy on Monday as I will be helping a friend with health issues in the afternoon. I have received plenty of super reviews this month, they are all very much appreciated. I have actually received five just today! I think I should get the guests at my party to make the competition draw this month and I can then put the photos on my Facebook page.